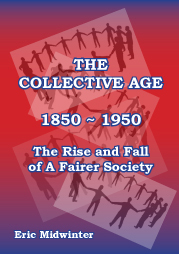 The Ebook version of THE COLLECTIVE AGE – suitable for any tablet or Kindle – is delivered via Kindle Direct Publishing (KDP Amazon). TO PURCHASE THE EBOOK, PLEASE CLICK ON ‘MORE INFO’ BELOW & FOLLOW THE INSTRUCTIONS. . The format allows you to access the many chapters and sub-chapters directly from the Table of Contents and use the search facility to pinpoint specific names or topics of interest. KDP sets it’s prices using the US dollar so the price may vary slightly but will be in the region of £8.00. TO BUY AS AN EBOOK CLICK HERE . DO NOT CLICK ON THE ‘ADD TO TROLLEY’ BUTTON BELOW.